Revise the address for the Recourse Directorate. Disclaimer: The company names and addresses are purely fictional for the purposes of outlining exactly how the information should be presented and formatted in Form B2. Any similarities presented in all examples in D17-2-1, to current or past importer or brokers are by coincidence only. This memorandum contains instructions for the completion, submission and processing of Form B2, Canada Customs Adjustment Request, to be followed by importers/agents when requesting adjustments to commercial transactions. Note: Form B3, Canada Customs Coding Form, is referred to as B3-3 (the electronic fillable version of the form) in many of the CBSA electronic documents. The customs document used to account for imported commercial goods is still called Form B3, as it will be referred to throughout this memorandum. 1. To request an adjustment to Form B3, an importer or agent must prepare Form B2, Canada Customs Adjustment Request. 2. This memorandum is to be used as a guide by those involved in preparing and processing Form B2 . 3. Up to three different legislative issues may be addressed on one Form B2 . However, issues that involve the Special Import Measures Act (SIMA) are to be presented on a separate Form B2. 4. Any applicable refund will be offset to the importer's account in ARL. Any residual credit on the account longer than the specified timeframe will then be refunded by cheque as long as it is over the established threshold. (a) The importer/agent has discovered an error with regard to the origin, tariff classification, or value for duty of the goods and is making a voluntary amendment ("self-adjustment") to their original declaration, as per their obligation under section 32.2 of the Customs Act (Act). For more information regarding "reason to believe" and the obligation to self-adjust please refer to Memorandum D11-6-6, "Reason to Believe" and Self-Adjustments to Declarations of Origin, Tariff Classification, and Value for Duty. (b) The importer/agent is submitting amendments to their declarations as a result of compliance verification. For more information on these types of adjustments, please refer to Memorandum D11-6-10 , Reassessment Policy. (c) The importer/agent wishes to apply for a refund under section 74 of the Act. For more information on the refund of duties on commercial importations, please refer to Memorandum D6-2-3, Refund of Duties. (d) The importer/agent has been given notice of a re-determination (as the result of compliance verification, or in response to a self-adjustment submitted by the importer/agent), and wishes to dispute that re-determination under section 60 of the Act. For more information on filing disputes, please refer to Memorandum D11-6-7, Request under Section 60 of the Customs Act for a Re-determination, a further Re-determination or a Review by the President of the Canada Border Services Agency. (e) The importer/agent is making a request for re-determination of provisional duty assessed by the CBSA under SIMA. For more information on this process, please refer to Memorandum D14-1-3, Re-determinations and Appeals Under the Special Import Measures Act. iv. in the importer/agent declaration field. vi. when the CBSA will correct Form B3 data using override procedures. The reasons for the CBSA's use of override procedures are noted in Memorandum D17-1-5, Registration, Accounting and Payment for Commercial Goods. (g) To correct a declaration of tariff classification involving diverted goods. Diversion occurs when goods have been accounted for on Form B3 under a conditional relief tariff item and are used or disposed of in a manner other than that specified in the conditional relief tariff item declared on Form B3. The Diversion of Imported Goods Exemption Regulations specify certain instances in which diversions need not be reported. ii. the "as accounted for" line(s) may be left blank except for Field 18 which must show the number of the B3 classification on which the goods were originally accounted for. For more information on the diversion of goods, please refer to Memorandum D11-8-5, Conditional Relief Tariff Items. 6. The CBSA will accept adjustment requests and render decisions for GST refund requests, where GST has been overpaid when accounting for imported commercial goods on a Form B3 . The CBSA will not issue a credit for the GST refund to the importer's account in ARL. Importers/agents who are GST registrants will receive the refund as an input tax credit from the Canada Revenue Agency (CRA). Information on input tax credits from the CRA can be found at the following webpage . After receiving a CBSA notice of decision, importers / agents who are non-GST registrants should attach Form GST 189, General Application for Rebate of GST/HST to the notice of decision and submit to the CRA to request their refund. (b) the importer/agent receipt copy. Where security is posted in lieu of payment of an amount in dispute,a third copy, the CBSA security copy is required. A photocopy is acceptable. When a Form B2 is submitted to correct a clerical/typographical error on ex-warehouse transactions, in addition to the copies noted above, another two copies of the Form B2 will be required (one for warehouse ledger control and one for the warehouse operator). When a SIMA assessment has been requested, an extra four remittance copies of the Detailed Adjustment Statement (DAS) are printed when both 30 and 90 day payment periods apply. The extra copies are provided so that the two payments can be made at different times (i.e. 30 and 90 days). In situations where a request is submitted under SIMA, security will only be accepted for provisional duty. 8. Companies may privately print Form B2 provided they comply with the conditions outlined in Memorandum D17-1-11, Private Printing Policy and Procedures. 9. Supporting documentation should accompany Form B2 and should be attached to the CBSA copy of the request, unless the explanation field provides a satisfactory reason why supporting documentation has not been presented. For example, documentation presented with a previous Form B2 transaction number concerning the same issue. The required supporting documentation will vary depending on the issue(s) being addressed by the request, with the relevant guidelines referenced in paragraphs 1-5 above. 10. If the "mail to" field contains a name other than the importer's and the name is not a licensed customs broker, the CBSA requires that a letter from the importer be attached to Form B2 authorizing the CBSA to mail the DAS to the agent. This letter must contain the required elements outlined in Memorandum D1-6-1, Authority to Act as an Agent in order to be considered written authority, and must be attached to Form B2 or the Form B2 will be rejected. (c) where the adjustment request documents goods which were imported under a remission order but which have become dutiable because they no longer satisfy the conditions of the remission order. For information on the acceptable forms of payment, please refer to Memorandum D17-1-5 . 12. When security or cash in respect of duties owing is not presented with the adjustment requests described above, proof of payment in the form of a duty paid DAS must be submitted, or if security was posted for a previous request, "on file" must be shown after the security number in Field 11 of Form B2. Failure to do so will result in the adjustment request being rejected. 13. When a Form B2 is submitted with payment, the payment must be for the full amount owing to the Receiver General. 14. Information on the requirements for posting security for amounts in dispute can be found in Memorandum D11-6-7 . 15. Once a properly coded Form B2 is completed, along with all of the required supporting documentation and payment/security if applicable, the Form B2 is to be submitted to the CBSA in accordance with the instructions below. 17. Forms B2 resulting from compliance verification (multi-program or single program) should be directed to the officer who conducted the verification. By facsimile to the attention of the Recourse Directorate, Trade Appeals and Litigation Division: 343-291-7239. 20. Upon receipt of a Form B2, the CBSA will date stamp all copies of the Form B2. The date stamp signifies receipt of the document; it does not indicate that legislative time limits have been met, or that the form and its attachments are accepted as complete. (d) interest will be paid on any part of the payment returned to the importer. 22. Requests will subsequently be reviewed by the Trade Operations Division to ensure that they have been completed in accordance with this memorandum and to verify that all program requirements have been met. 23. The request may be rejected if it is not completed properly, is not compliant with program requirements, or if it contains errors. A rejection does not constitute a redetermination under section 59 of the Act, therefore no decision has been issued and time limits are not protected. 24. Once a decision is made regarding the request, and the CBSA processes have been completed, a DAS will be printed which will indicate the notice of decision, the reason for decision, and the total amount (if applicable) either due or refundable. 25. A DAS serves as a notice of assessment by the CBSA in response to an importer's/agent's adjustment request or a redetermination initiated by the CBSA. (b) Notice of Assessment: to notify importers/agents when a CBSA initiated review of Form B3 results in the accounting document data being adjusted. This review could result in a refund, collection or non-revenue adjustment. (c) To cancel an old DAS and request a new amount due. (d) To notify the importer/agent that interest has been cancelled or waived. 27. The DAS provides all the header information, the adjusted line, the adjusted totals of the Form B3 trailer associated with the adjustment, interest if applicable, the reviewing officer's remarks and any appropriate legislative statements including the periods for requesting a further review. For more information on the application of interest, please refer to Memorandum D11-6-5, Interest and Penalty Provisions: Determinations/Re-determinations, Appraisals/Re-appraisals, and Duty Relief. (c) copy three is sent to the broker/agent, where applicable. Note: In accordance with Government of Canada policy, all commercial refunds in the amount of $2.00 or less in duties and taxes will not be refunded. (c) copy three to the broker/agent, where applicable. (d) Copy four to the broker/ agent, where applicable. 31. In addition, four additional copies of the last page of the DAS (remittance copies) will be sent to the party responsible for payment of the amount due. 32. When a DAS is returned to the CBSA as undeliverable, the documents will be reviewed by the CBSA to determine where the DAS should be mailed. If an address cannot be determined, the CBSA will contact the importer/agent and advise them to contact the CRA to update their business address. Details on business address changes are provided through the CRA website . 33. When payment is made, all copies of the DAS are stamped "duty paid". The first two copies are given to the importer/agent as proof of payment. The third and fourth copies are filed with the CBSA. 34. In all cases, Form B2, the DAS and the accounting documents are forwarded to the regional record room for filing. See Appendix D for DAS examples and explanations. 35. For more information, within Canada call the Border Information Service at 1-800-461-9999. From outside Canada call 204-983-3500 or 506-636-5064. Long distance charges will apply. Agents are available Monday to Friday (08:00 – 16:00 local time / except holidays). TTY is also available within Canada: 1-866-335-3237. 1. Forms B2 must be properly coded before they can be accepted for either manual or automated data processing. Information used to prepare these requests is obtained from Form B3 accounting documents, invoices, and other sources, and is to be coded and placed in a designated area on the Form B2, referred to as a field. v. Declaration – The reference to "importer/agent" should be struck out and replaced with "appellant from a NAFTA country". Indicate the importer business number, name and address including correct postal code on the first page of Form B2 . If the Form B2 has two or more pages, complete only on the first page. 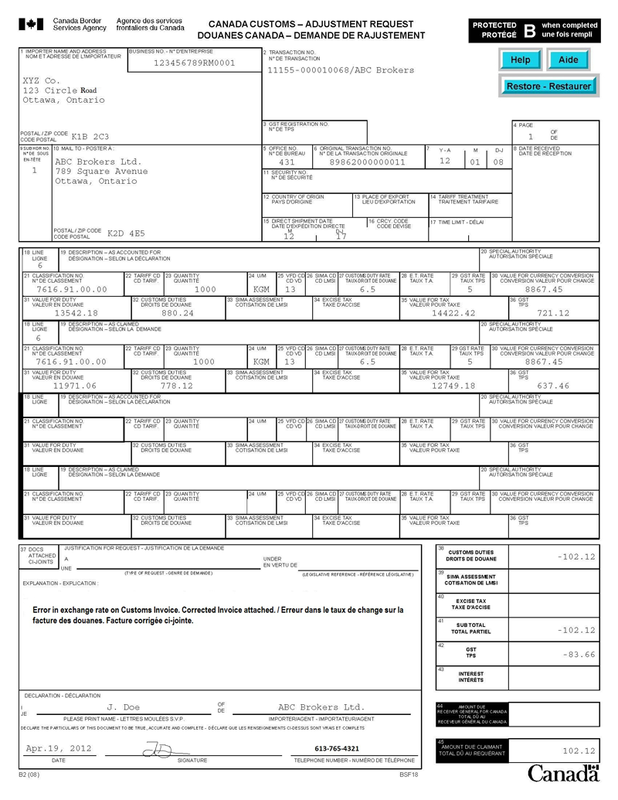 This information must be the same as indicated on the original accounting document (i.e., Form B3). (c) The last digit is a check digit calculated using a formula provided by the CBSA (refer to Memorandum D17-1-10, Coding of Customs Accounting Documents, Appendix F). Show the transaction number on all copies of the Form B2 and on the first page of any supporting documents. Any importer/agent who has an account security number with release prior to payment privileges must submit all adjustment documentation with the transaction number bar-coded on the first page of the CBSA office copy of Form B2. Refer to Memorandum D17-1-10, Appendix H, for bar code specifications. The typed or clearly annotated transaction number must also appear on all remaining pages of the Form B2 and the first page of any supporting documentation. (b) prepare bar-coded transaction numbers using the check digit calculation described in Appendix F, and the bar code specifications described in Appendix H of Memorandum D17-1-10 . The account security number used with the Form B2 transaction number does not have to be the same as the one used with the corresponding Form B3 transaction number. In the event that a Form B2 request is cancelled, the claimant must use a new transaction number if the request is re-submitted. The transaction number must not be duplicated for a six-year period plus the current calendar year. Complete on all Forms B2 where the importer has been assigned a GST registration number. If the Form B2 has two or more pages, complete only on the first page. Show the nine-character numeric GST registration number assigned to the importer identified in Field 1. As per Memorandum D17-1-10, if a business number was entered in Field 1, this may be left blank. Must be completed on each page of the Form B2, including single page requests, numbered in sequence starting with 1. The "of" portion of the page number may be left blank. Must be completed on all Forms B2 . 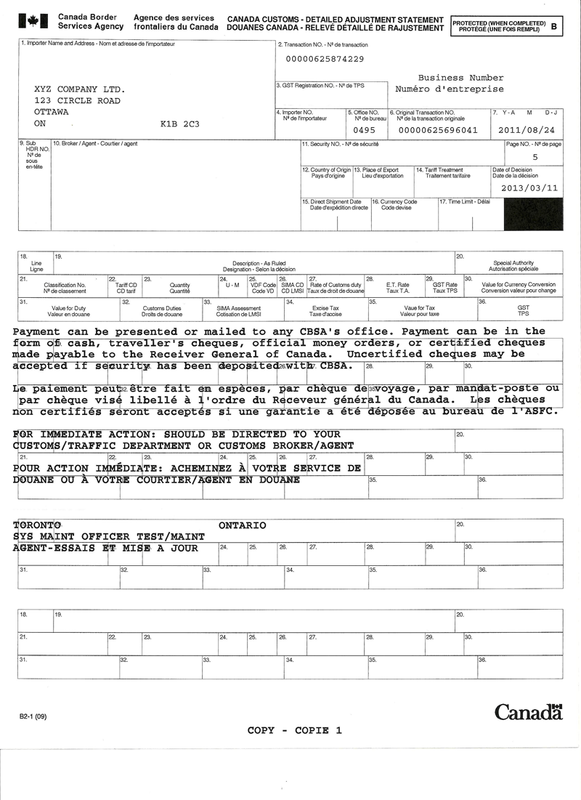 Show the CBSA office code number used on the Form B3 accounting transaction. If the Form B2 has two or more pages, complete only on the first page. Must be completed on the first page of all Forms B2 . Show the transaction number assigned to the original accounting document (i.e., Form B3) for which a request is being made. When Form B2 is presented to report a diversion, show the original Form B3 transaction and tariff classification line numbers affected by the diversion. Subject to the appropriate regional Trade Operations Division Manager's prior approval, a representative Form B3 transaction and tariff classification line number or a CBSA assigned transaction number will be accepted, provided the Trade Operations Division Manager is satisfied that it is not feasible to provide the original Form B3 transaction and line number affected by the diversion. Must be completed on the first page of all Forms B2 . For shipments duty paid at terminal locations, show the date that appears in the "Accounting Date" field of the Form K84, Importer/Customs Broker Account Statement, or, in the case of cash transactions, show the date appearing in the "Statement Date" field of the Detailed Coding Statement (DCS). For shipments duty paid at non-terminal locations or for recovery mode accounting documents, show the "date stamp" date that appears on the Form B3 receipt copy. Enter YY MM DD (year, month, day). For the CBSA use only. (c) the number of the sub-header to which a classification line or portion of one is being moved (e.g., moving a portion of classification line 1 from sub-header 1 to sub-header 2 in order to change the tariff treatment from MFN to UST). Must be completed on the first page of all Forms B2 only if the mailing address differs from the address shown in Field 1. When completed, show the name and address including correct postal code of the individual to whom the DAS is to be mailed to. If the "Mail To" field contains a name other than the importer's, and the name is not a licensed customs broker, the CBSA requires that a letter from the importer be attached to the Form B2 authorizing the Agency to mail the DAS to the agent. The letter of authorization must be attached to the Form B2 or the request will be rejected. However, where the declaration box of the Form B2 clearly indicates the importer's name and the Form B2 are signed by the importer, the CBSA will not require an authorization letter. Complete only if security is being posted. When a security bond has been posted for an amount in dispute (not to be confused with security posted for release prior to payment), indicate the number of the bond; when cash or certified cheque is used as security, the CBSA will place the K21 receipt number in this field. If a bond was posted for an amount in dispute with the CBSA for a previous related adjustment request, indicate "on file" after the security number. In situations where an amount owing is partly covered by security, and the remainder paid by cash, the bond number must be quoted. (b) the country of origin is being changed from the most recent transaction (i.e., Form B3 or previous DAS). Show the International Organization for Standardization (ISO) country code for the country of origin (e.g., Canada – CA, United States – US). Refer to the list of country and state codes in Appendix G, List 1 of Memorandum D17-1-10 . Each new country code must be shown on a new sub-header. (b) the country of export is being changed from the most recent transaction (i.e., Form B3 or previous DAS). For goods exported from the US, show the three digit alphabetic state code of the new state when the state of export is being changed. This field is to be left blank when the foreign trade zone code is changed. Show a two digit alphabetic state code prefixed by U if the country of export is the US. Show the two digit alphabetic ISO country code if the country of export is other than the US. Refer to the list of country codes in Appendix G, List 1 of Memorandum D17-1-10 . Each new country or US state code must be shown on a new sub-header. (b) the tariff treatment is being changed from the most recent transaction (i.e., Form B3 or previous DAS). Each new tariff treatment must be shown on a new sub-header. For a list of tariff treatment codes, as well as conditions for the use of particular codes, please refer to Appendix B of Memorandum D17-1-10 . (b) the direct shipment date is being changed from the most recent transaction (i.e., Form B3 or previous DAS). Complete on the first page of each sub-header if the currency code is other than Canadian dollars. May be left blank if the currency code is Canadian dollars. Show MM DD (month, day). Each new date must be shown on a new sub-header. (b) the currency code is being changed from the most recent transaction (i.e., Form B3 or previous DAS). The International Organization for Standardization Codes (ISO) must be used (e.g., Australian Dollar = AUD). Refer to the list of currency codes in Appendix G, List 1 of Memorandum D17-1-10 . Each new currency must be shown on a new sub-header. (b) the time limit is being changed from the most recent transaction (i.e., Form B3 or previous DAS). When adjustments are requested to 1/60th and 1/120th transactions, the total amount of elapsed time plus any requested extensions must be shown in months. When goods which were accounted for on a 1/60th or 1/120th basis are being entered for consumption, this field is to be left blank. Each new time limit must be shown on a new sub-header. Complete these fields exactly as they appear on the most recent transaction (i.e., Form B3 or previous DAS) for each classification line being adjusted. Complete these fields as described below. Must be completed on each classification line. The line number from the original Form B3 transaction or the line number assigned by the CBSA for a new line or split line on a previous adjustment to the same transaction must be used. If a classification line from the original accounting document (i.e., Form B3) or adjustment document is split into two or more lines, the line from which the split is being created should be quoted. For example, if classification line number 1 is the parent line (line being split), "1/SL" should be quoted in the Line No. field of each "as claimed" line which is derived from line 1, and a new line number will be assigned by the CBSA. Split lines are created when a classification line must be split into two or more sections (e.g., when an adjustment issue applies only to a portion of a classification line). Must be completed on all classification lines. Show an accurate description of the goods. Include tariff code description, if applicable. All references, such as D-Memorandum numbers, value and classification ruling numbers, import permit numbers, etc., are to be shown here. When more than one date of diversion applies, show the date in the description field of the appropriate classification line. Complete on all classification lines, if applicable. Leave blank on any classification line where an Order in Council other than a remission order reduces or removes duties on specified goods (e.g., an Order in Council creating a new code). When the owner is authorized by Order in Council to import goods under special conditions, the Order in Council number is to be shown in this field. (a) Orders in Council submitted to the Governor in Council by the Treasury Board: e.g., Order in Council number P.C. 1973-1/82, January 9, 1973, must be shown as: 73-1-82. (b) Orders in Council submitted to the Governor in Council by the department concerned: e.g., Order in Council number P.C. 1970-1835, October 21, 1970, must be shown as: 70-1835. If the Order in Council number contains an oblique stroke (/), this must be shown as a hyphen (-). For example, Order in Council number 67-23/261 must be shown as: 67-23-261. Where a Form B2 for goods covered by an Order in Council contains two or more lines of calculations and several classification numbers, the Order in Council number must be shown again with each new classification line. In any case where an Order in Council is amended, the original Order in Council number must be quoted in this field. That is, the number of the amending Order in Council is to be ignored. The benefits of the United States Tariff and the Mexico Tariff may, pursuant to the Textile and Apparel Extension of Benefit Order, be extended to certain textile and apparel goods which are cut and sewn or otherwise assembled (or woven or knit) in the United States or Mexico from fabric (or yarn or fiber) produced or obtained in a non-NAFTA country. When accounting documents are presented for such goods, the special authority number 61-3-62 must be shown. In the event an Order in Council applies to these goods, the number for that Order would take precedence over the special authority number 61-3-62 used to identify the textile or apparel goods referenced above. Must be completed on all classification lines. Show the correct tariff classification number as indicated in the Customs Tariff for each commodity being adjusted. The first six digits represent the International Harmonized System Code, the seventh and eighth digits are sub-divisions for CBSA purposes and the remaining two digits represent a statistical suffix. Decimal points must be placed after the fourth, sixth and eighth digits (e.g., 1234.56.78.90). Complete on all types of Forms B2 if the conditions specified in the code description in the Customs Tariff are applicable. Where both a tariff code and an Order in Council (refer to Field 20 – Special Authority) are necessary to eliminate or reduce the effective rate of duty, both Fields 20 and 22 must be completed. Must be completed on all classification lines in the unit of measure required by the Customs Tariff . If a quantity is required for excise tax rates in a unit of measure different from that specified in the Customs Tariff, the non-tariff quantity should be indicated on the next Form B2 "as claimed" line. Line number must not be completed for the second detail line. If only one quantity applies to a tariff classification number, it must be shown on the first detail line. However, this quantity may be repeated on subsequent detail line(s). Leave blank if no unit of measure is applicable from the Customs Tariff or to any excise tax rates. Complete on all classification lines as specified in the Customs Tariff . If a unit of measure is required for excise tax that is different from that specified in the Customs Tariff, the non-tariff unit of measure should be completed on the next Form B2 "as claimed" line. Line number must not be completed for the second Form B2 line. As a result of the Customs Tariff requirements, only metric alphabetic codes can be used. Refer to unit of measure codes in Appendix G, List 2 of Memorandum, D17-1-10. Complete on each classification line. Use a combination of one of the first digit code numbers and one of the second digit code numbers to indicate the basis on which the value for duty was determined. 1 The vendor and purchaser are not related firms as defined in subsection 45(3) of the Act. 2 The vendor and purchaser are related firms as defined in subsection 45(3) of the Act. Note: If a used goods rate of duty advance is applicable, code "1" must be prefixed to the value for duty code. Example: If the vendor and purchaser are related firms and the value for duty is the transaction value of similar goods, code 26 is shown. If the used goods advance applies, code 126 is shown. Complete if a SIMA amount is shown in Field 33 – SIMA Assessment. Complete on each classification line if a rate of customs duty is applicable. 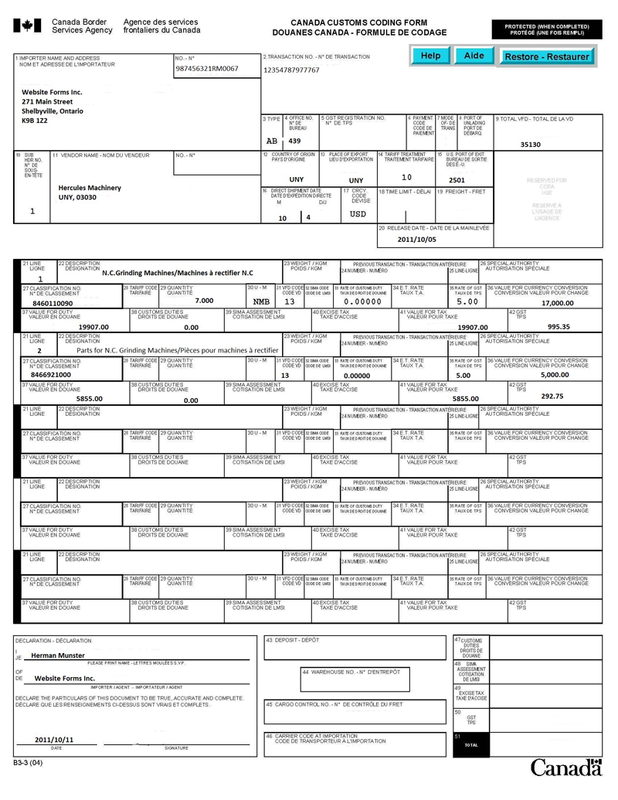 Where both percentage and specific duties apply, the percentage rate of duty is shown on the first detail line. The specific rate of duty is shown on the next detail line. Line number must not be completed for the second detail line. If an additional rate of duty equivalent to an excise duty is applicable, show this rate of duty on the next detail line in this field. Line number must not be completed for this line. If applicable, complete on each classification line either with an excise tax rate or an excise tax exemption code. Where an exemption code is applicable, complete this field using numbers listed in Appendix G, List 4 of Memorandum D17-1-10 . If excise tax is not applicable, leave this field blank. Commodities with different excise tax rates or exemption codes must be coded on separate classification lines. Note: Goods subject to excise tax may not be combined on the same classification line with goods not subject to excise tax. Complete with either a GST rate or an exemption code on the first detail line of each classification line. Where the GST is payable, show the current rate (e.g., 5 or 5.0); where the GST is not payable, show the appropriate exemption code. Where an exemption code is applicable, complete this field using code numbers listed in Appendix G, List 3 of Memorandum D17-1-10 . "Subject to the provisions of rule 5(a) above, packing materials and packing containers presented with the goods therein shall be classified with the goods if they are of a kind normally used for packing such goods. However, this provision is not binding when such packing materials or packing containers are clearly suitable for repetitive use". In the latter cases, packing is either non-taxable under the same code as the goods which it contains or taxable if the goods are subject to GST. Therefore, importers/agents should ensure that each line accounting for the goods is followed by the relevant packing line using the same GST rate or exemption code if applicable. Complete on each classification line. Show this amount in the currency specified on the invoice. Show the amount in dollars and cents separated by a decimal point. For example $1,000.00 is shown as 1000.00. For assistance in determining the amount to be shown in this field, refer to Memoranda D13 series. Complete on each classification line by multiplying the value for currency conversion by the exchange rate. Show the value for duty in Canadian dollars separated by a decimal point. For example $96.00 is shown as 96.00. Calculations must be made to the cent. Complete on all classification lines if customs duty is applicable. Show the amount of customs duty (not including provisional, anti-dumping or countervailing duty) payable in dollars and cents separated by a decimal point. For example $105.00 is shown as 105.00 and $123.84 as 123.84, etc. When a percentage rate of duty applies, duty is obtained by multiplying the rate by the value for duty. When a specific rate of duty applies, duty is obtained by multiplying the rate by the quantity. Deposits for sight entries, if applicable, are to be shown on a separate detail line in this field. Note: Special calculations may apply if a remission is applicable. Complete on all Forms B2 if an amount of surtax, provisional, anti-dumping or countervailing duty is being adjusted, or is payable. When goods are subject to surtax (refer to Memoranda D16 series), provisional/anti-dumping duty (refer to Memoranda D14 series) or countervailing duty (refer to Memoranda D15 series), show the amount in dollars and cents separated by a decimal. For example $105.00 is shown as 105.00 and $123.84 as 123.84, etc. Note: These duties form part of the value for the calculation of excise tax and GST, except if provisional duty is deferred by bond. Complete on each classification line if an excise tax is applicable. Where an ad valorem rate applies, multiply the excise tax rate by the total of the value for duty plus customs duties plus any SIMA assessment and show the total amount in this field. When a specific rate applies, calculate excise tax by multiplying the quantity times the excise tax rate. Note: Special calculations may apply if a remission is applicable. For more information, please refer to the list of Excise Tax Exemption codes found in Appendix G, List 4 of Memorandum D17-1-10 . (b) GST may be rebated by the CRA to a non-registrant as a result of the CBSA rendering a related adjustment decision (e.g., a re-determination of tariff classification decision under section 60 of the Act which lowers the tariff rate from 9.2 per cent to 6.8 per cent). Add the value for duty plus customs duties plus any SIMA assessment plus any excise tax and show the total amount in this field. Show the amount in dollars and cents separated by a decimal point. For example, $1056.00 is shown as 1056.00. (b) GST may be rebated by the CRA to a non-registrant as a result of the CBSA rendering a related adjustment decision (e.g., a re-appraisal decision under section 60 of the Customs Act which lowers the value for duty from $100 to $50). Calculate the GST to the cent by multiplying the rate of GST by the Value for Tax. Show the amount of GST, if any, in dollars and cents separated by a decimal point. Complete this field with a check mark if supporting documentation is attached, otherwise leave blank. Complete on all Form B2 if customs duties are payable or refundable. If customs duties are refundable, show a negative sign in front of the amount shown in this field. If there is no customs duty payable, or refundable, leave blank or show any combination of zeros. To obtain total duty, calculate the difference between the "as accounted for" and "as claimed" amounts shown in Field 32 – Customs Duties and include any sight deposit amount. Show the total in dollars and cents separated by a decimal. If the Form B2 has two or more pages, complete this field only on the last page. Complete on all Form B2 if a SIMA Assessment amount is payable or refundable. If a SIMA Assessment is refundable, show a negative sign in front of the amount shown in this field. To obtain total SIMA assessment, calculate the difference between the "as accounted for" and "as claimed" amounts shown in Field 33, unless the amount is deferred by bond as designated by SIMA Assessment code 32 in Field 26. Show the total in dollars and cents separated by a decimal point. If the Form B2 has two or more pages, complete only on the last page. Complete on all Forms B2 if excise tax is payable or refundable. If excise tax is refundable, show a negative sign in front of the amount shown in this field. Where there is no excise tax payable or refundable, leave blank or show any combination of zeros. To obtain total excise tax, calculate the difference between the "as accounted for" and "as claimed" amounts shown in Field 34. Show the total amount of all excise tax in dollars and cents separated by a decimal point. The total of the amounts of Fields 38 to 40. Complete on all Forms B2 if GST is payable or, for non-registrants where GST may be rebated by the CRA. Where there is no GST payable or subject to rebate, leave blank or show any combination of zeros. Add each of the detail line (Field 36) GST amounts to obtain total GST. Show the total amount of all GST in dollars and cents separated by a decimal point. It is not mandatory that the importer/agent complete this field. When interest is payable or refundable, the CBSA will show the date interest begins as well as the principal on which interest will be assessed in the "remarks section" of the resulting DAS. If the importer/agent shows the amount of interest payable or refundable, it is to be completed on the last page of the adjustment request. Must be completed on the last page of all Forms B2 when an amount is payable to the Receiver General for Canada. Leave blank if an amount is not due to the Receiver General. Note: Importers cannot offset a GST amount which may be refundable against a duties amount (customs duty, SIMA assessment and/or excise tax) which is payable on the same Form B2. However, an importer can offset a GST amount which is payable against a duties amount (customs duty, SIMA assessment and/or excise tax) which is refundable on the same Form B2. Must be completed on the last page of all Forms B2 when requesting a refund, or when requesting a complete reversal of a CBSA decision which has been secured, not paid. The GST amount shown in Field 42 must not be included in the amount shown in this field. Must be completed on the last page of all Form B2 . When a request for re-determination of the origin of goods pursuant to the Act is submitted, it is to be shown as: re-determination/origin followed by the appropriate legislative reference. Indicate as follows: the reason (i.e., refund, re-determination, re-appraisal), section, subsection and/or paragraph number of the Act as applicable (e.g., 74(1) (d) of the Act, 59(1) of the Act). If more than one legislative reference applies, the additional reference(s) is/are to be shown in the "Explanation" section. Where applicable, the file number and date of the previous CBSA decision supporting the request should be indicated. Further information on requests to cancel or waive interest and/or penalties can be found in Memorandum D11-6-5 . A request from a US appellant under SIMA should be shown as a re-determination (select one or more of the following: normal value, export price, amount of subsidy, or description) followed by the appropriate legislative reference. Note: All requests for re-determinations under SIMA must be filed with the Trade Compliance Division in Ottawa (see paragraph 19). For additional information, refer to Memorandum D14-1-3 . It is imperative that each Form B2 presents a logical case, supported by appropriate information. Clearly state the reason(s) for the request, providing as much detail as is required to defend it. Make reference to any previous CBSA instructions or D Memoranda that are relevant. If sufficient space is not available, provide additional particulars on a separate sheet. (e) Where a diversion applies, the date of diversion. When more than one date applies, show the date in the description field of the relevant classification line. With regard to supporting evidence (item (d) above), the CBSA will consider any documents or other attachments the importer may wish to submit. However, certain specific types of evidence will facilitate the expeditious resolution of requests. Further information on the supporting documentation requirements for filing dispute notices can be found in Memorandum D11-6-7 . For example where an obvious error (e.g., mathematical extension and currency conversion errors) was made on the original accounting document (i.e. Form B3), DAS, purchase orders, sales contracts, commercial invoices or letters of credit, might support an appellant's claim. Where an importer is questioning the tariff classification number, appropriate evidence could include product literature/specifications, catalogues, detailed purchase documents (e.g., commercial invoices) and samples of the imported goods. Note: Hazardous, corrosive and liquid products require special handling. Contact your regional CBSA office before submitting such samples. A revised Form CI1- Canada Customs Invoice, by itself will not be regarded as supporting documentation. Where supporting documents have been attached to a related request, identical supporting documents need not be attached to a subsequent request, provided that the "Explanation" field includes a statement that the relevant supporting evidence is attached and the related Request Number is provided. It is the responsibility of the applicant to present a properly completed and supported Form B2. The absence of adequate information will result in the rejection of the Form B2 following initial review, as per paragraph 24 of this memorandum. Complete on all Forms B2. If the request has two or more pages, complete only on the last page. Show the name and telephone number of the person making the declaration along with the company name. 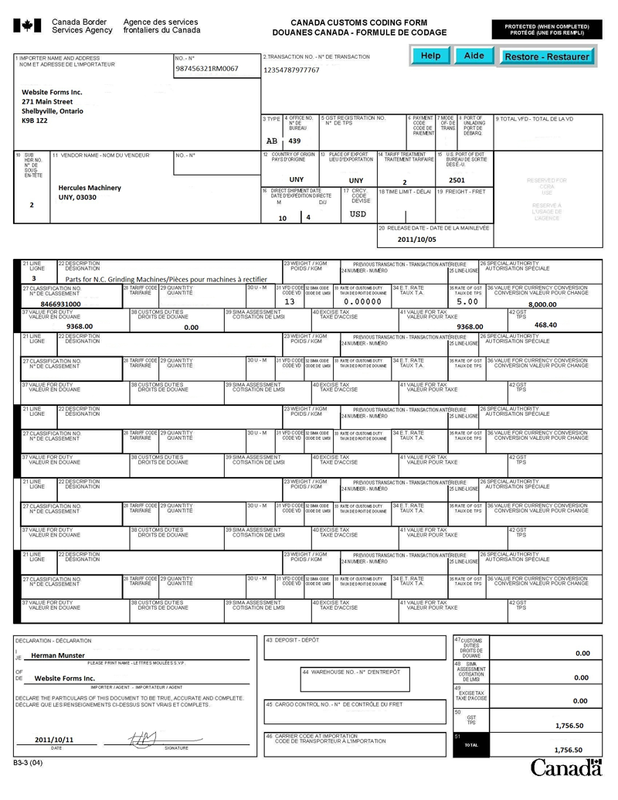 Date and sign the declaration on the CBSA copy of all adjustment forms. The person making the declaration is indicating that the information contained on the Form B2 is accurate and complete. The provision of inaccurate, untrue or incomplete information is an infraction and may result in enforcement action. Note: The importer/agent declaration must be signed by the person named in the declaration. The examples included in this section are designed to provide importers/agents with information regarding the various Form B2 format requirements. These examples depict typical not actual transactions. The rates of duty, GST and excise taxes used for calculation and testing purposes on the samples are those in effect at the time of printing. Therefore, while the actual coding on the samples is correct, information such as tariff rates and excise tax rates, etc., should be verified by checking the Customs Tariff, the Excise Tax Act and other reference sources. Bar codes shown on the Form B2 examples are for illustration purposes only. Owing to the space requirements of bilingual formats, Field No. 19 – Description; justification for request; and explanation; have been left blank in the samples which follow. For actual requests, these fields must be completed in accordance with the completion instructions contained in this Memorandum. 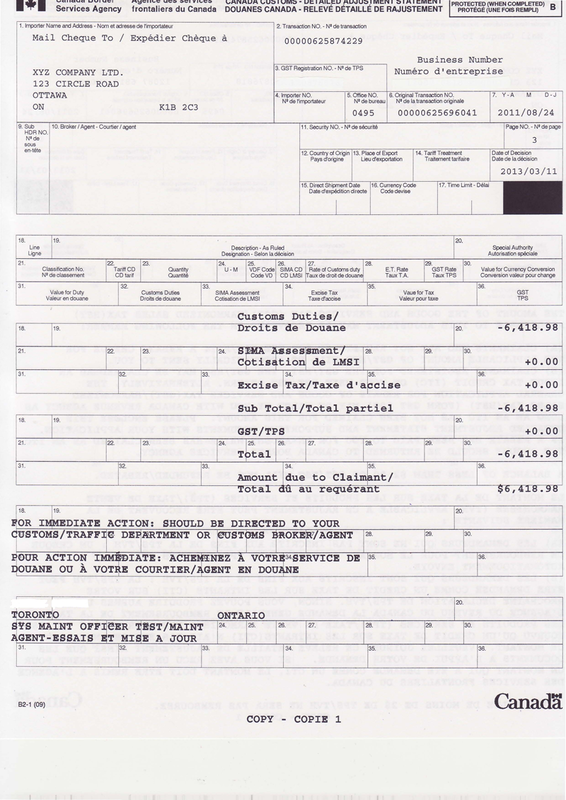 This example shows a request for a refund of duties when there is an error on the original transaction not related to tariff classification or value for duty. 1st line "As Accounted For" portion – Show the total value of the goods and the full amount of duties payable on the goods as accounted for on the original Form B3. 1st line "As Claimed" portion – Show the total value of the goods and corresponding extensions as claimed by the importer/agent. Note that the total shown in Field 45- Amount Due Claimant, does not include any amounts of GST. This example shows a change in tariff classification number that does not cause a change in the revenue reported. 1st line "As Claimed" portion – Show the total value of the goods and the full amount of duties payable on the goods under the corrected tariff classification number. This example shows a request for a re-determination of the tariff classification. This example shows a request for re-determination of the tariff classification. 1st line "As Accounted For" portion – Show the total value of the goods and the full amount of duties payable on the goods as accounted for on the original Form B3 under a specific tariff classification number. This example shows a request for a re-appraisal of the value for duty of the goods. This example shows a re-appraisal of the value for duty of the goods where the regular customs duty and two different specific rates of duty apply to the same tariff classification number. 1st line "As Accounted For" portion – Show the total value of the goods and the regular customs duty payable on the goods as accounted for on the original Form B3. 1st line "As Claimed" portion – Show the total value of the goods and the customs duty as claimed by the importer/agent. 2nd line "As Accounted For" portion – Leave blank. 2nd line "As Claimed" portion – Show the first amount of specific duty as accounted for on the original Form B3 (this line has not changed). 1st line, page 2 "As Accounted For" portion – Show the 2nd amount of specific duty and GST as accounted for on the original Form B3. 2nd line, page 2 "As Claimed" portion – Show the 2nd amount of specific duty and GST as claimed by the importer/agent. This example shows how to validate sight documentation and to request a refund of the sight deposit. 1st line "As Accounted For" portion – Show the total value of the goods and the full amount of duties paid on the goods as accounted for on the sight document B3 for each classification line. 1st line "As Claimed" portion – Show the total value of the goods and the full amount of duties payable on the goods under the current value for duty. 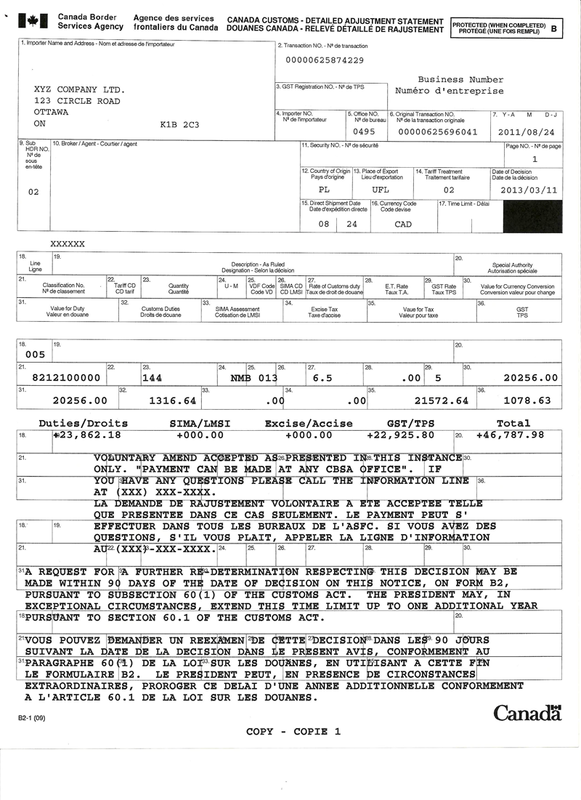 2nd line "As Accounted For" portion – Show the amount of the sight deposit paid on the original sight document B3. 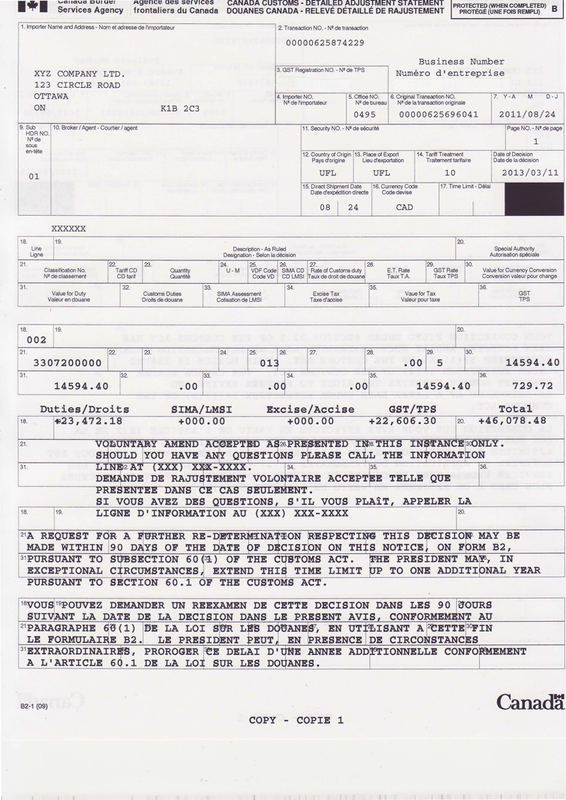 2nd line "As Claimed" portion – Show 0.00 in Field 32 – Customs Duties. This example shows how to perfect a sight document when the sight deposit is credited against the additional amount of duty owing. 1st line "As Accounted For" portion – Show the total value of the goods and the full amount of duties paid on the goods as accounted for on the sight document for each classification line. 1st line "As Claimed" portion – Show the total value of the goods and the full amount of duties payable on the goods under the correct tariff classification number. 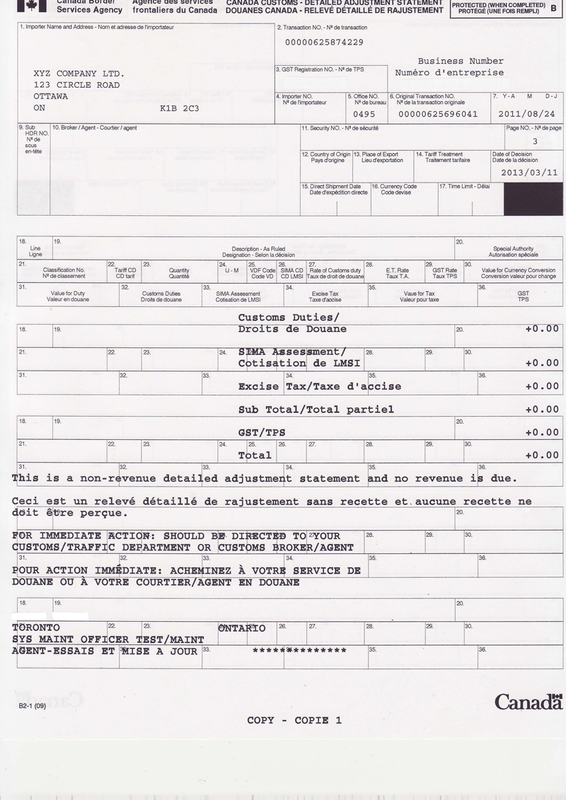 This example illustrates the documentation required for the first diversion of a portion of a shipment of goods to a use other than that for which they were imported. 1st line "As Accounted For" portion – Show the total value of the goods and the full amount of duties paid on the goods as accounted for on the Form B3 under a specific tariff classification number. 1st line "As Claimed" portion – Show the total value of the non-diverted goods and the amount of duties applicable using the original tariff classification number. 2nd line "As Claimed" portion – Show the value of the goods being diverted, the appropriate tariff classification number and the duties payable. This example illustrates a subsequent diversion of a portion of a shipment of goods to a use other than that for which they were imported. Such diversions may or may not be to the same tariff classification number and use as a previous diversion. 1st line "As Claimed" portion – Show the value of the non-diverted portion of these goods and the duties applicable using the original tariff classification number. Explanation Field – Indicate the transaction number of the Form B2 from which the 1st line "As Accounted For" classification line was transcribed (56010-00001000-2 for this example). This example shows that a shipment accounted for on a 1/60th basis will remain in Canada for an additional two-month period (first adjustment). 1st line "As Accounted For" portion – Show the total value of the goods and 1/60th of the total value applicable to the number of months accounted for on the original Form B3. 1st line "As Claimed" portion – Show the total value of the goods and 1/60th of the total value of the goods applicable to the total number of months they will remain in Canada. Notes: The value for duty amounts shown in Field 31 – Value for Duty of the "As Accounted For" and "As Claimed" sections of the request are calculated as shown below. As Accounted For – 2,000 x 1 (exchange rate) ÷ 60 (1/60 basis) x 1 (number of months) = 33.33. As Claimed – 2,000 x1 (exchange rate) ÷ 60 (1/60 basis) x 3 (number of months) = 99.99. A sub-header number is shown in field 9 as the time limit (field 17) is being changed from one to three months. The original Form B3 had only one sub-header (1) as well as one classification line. This example shows a second extension for a shipment accounted for on a 1/60th basis (second adjustment). 1st line "As Accounted For" portion – Show the total value of the goods in Field 30 – Value for Currency Conversion and 1/60th of the total value applicable to the number of months the goods remained in Canada in Field 31- Value for Duty. 1st line "As Claimed" portion – Show the total value of the goods in Field 30 – Value for Currency Conversion and 1/60th of the total value applicable to the total number of months the goods will remain in Canada in Field 31- Value for Duty. Note: The value for duty amount shown in Field 31 – Value for Duty of the "As Claimed" section of the request is calculated as shown below. As Claimed – 2,000 x 1 (exchange rate) ÷ 60 (1/60 basis) x 4 (number of months) = 133.32. This example shows that part of a shipment accounted for on a 1/60th basis is being exported and the remainder is being duty paid. 1st line "As Accounted For" portion – Show the total value of the goods and 1/60th of the total value applicable to the number of months for which they were originally accounted for. 1st line "As Claimed" portion – Show the total value of the goods being duty paid. 2nd line "As Claimed" portion – Show the total value of the goods being exported and the value of the goods and duties paid applicable to the number of months they remained in Canada. Note: The explanation for example 12 outlines the method used to calculate the value for duty when goods are accounted for on a 1/60 basis. This example shows that part of a shipment accounted for on a 1/60th basis is exported and the remainder is accounted for an additional four-month period. 1st line "As Accounted For" portion – Show the total value of the goods and 1/60th of the total value of the goods applicable to the number of months as accounted for on the original Form B3. 1st line "As Claimed" portion – Show the total value of the goods actually exported and 1/60th of the value of exported goods applicable to the number of months they remained in Canada. 2nd line "As Claimed" portion – Show the total value of the goods being imported for an additional period of time and 1/60th of the value of the goods being imported for the additional period of time applicable to the total number of months they will remain in Canada. The explanation for example 12 outlines the method used to calculate the value for duty when goods are accounted for on a 1/60th basis. A sub-header number is shown in field 9 as the time limit (field 17) is being changed from three to seven months. The original Form B3 had only one existing sub-header (1) as well as one classification line. This example shows a clerical/typographical type adjustment where the importer/agent is making a correction to the quantity field. The original Form B3 showed a quantity of 100, 000 rather than the correct amount of 10, 000. (f) Field 37 -Explanation (must indicate the reason for the request)and Declaration. In addition, the field being corrected must also be completed. Situations may arise where the field being corrected (i.e., Cargo Control Document Number, Vendor Name) is not contained on the Form B2. In such cases, the explanation field must identify the Form B3 field being corrected. This example shows a request for a re-determination as to whether or not the imported goods are of the same description as those for which there is a finding by the Canadian International Trade Tribunal. 1st line "As Accounted For" portion – Show the SIMA assessment amount (anti-dumping duty) and GST paid on the goods as accounted for on the original Form B3. 1st line "As Claimed" portion – Show the SIMA assessment amount (anti-dumping duty) and GST as claimed by the importer/owner. This example shows a request for a re-determination of origin when a portion of the imported goods is eligible for an alternate tariff treatment. 1st line "As Accounted For" portion – Complete fields 18 to 36 as shown on the original Form B3. 1st line "As Claimed" portion – Complete fields 18 to 36 for the portion of the classification line not affected by the adjustment request. 1st line "As Accounted For" portion – Leave blank. 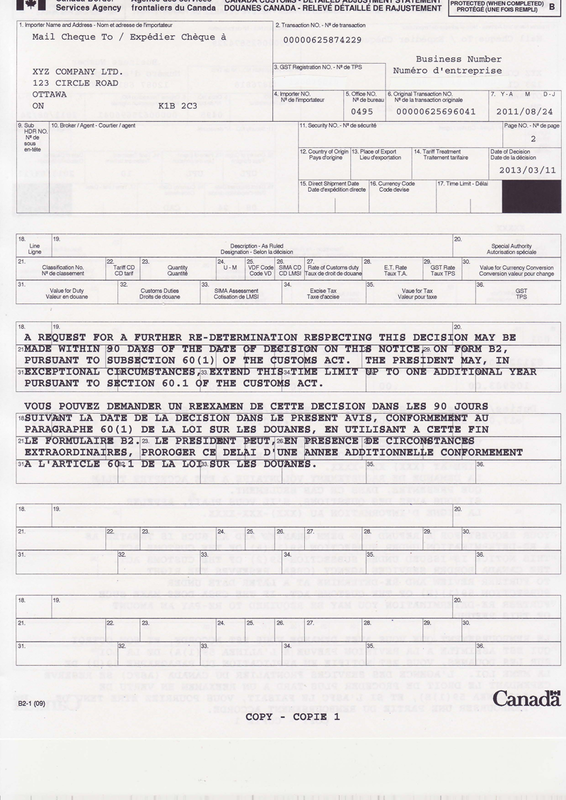 1st line "As Claimed" portion – Complete fields 18 to 36 showing the changes requested (i.e., rate of duty) to document the Adjustment Request. Note: Number "2" is shown in field 9 (Sub Header No.) as the portion of the Form B3 classification line is being moved from sub-header 1 to sub-header 2. This example shows a request for multiple issues: a re-determination of the tariff classification/origin and a re-appraisal of the value for duty of the goods. 1st line "As Claimed" portion – Complete fields 18 to 36 showing the changes requested in order to document the three legislative issues being contested. Note: A sub-header number 1 is shown in field 9 as the country of origin is being changed from Germany to the US and the tariff treatment is being changed from the Most-Favoured-Nation Tariff Treatment (MFN) to the United States Tariff Treatment (UST). The original Form B3 only had one existing sub-header (1) as well as one classification line. This example shows a request for a re-determination of origin for one piece of steel hardware as well as reporting a drawback claim for the customs duties on the remainder of that shipment. 1st line "As Claimed" portion – Show the total value of the goods for which drawback of duties was claimed by importer/owner. Include the drawback claim number in description field 19. 2nd line "As Claimed" portion – Leave blank. 1st line, page 2 "As Accounted For" portion – Leave blank. 1st line, page 2 "As Claimed" portion – Show the total value of the goods for which the tariff treatment is being changed from MFN to UST. Note: Number 3 is shown in field 9, page 2, assuming that sub-header 3 of the Form B3 being adjusted covered UST. This example shows goods which were temporarily imported and were subject to full relief of duty but only partial relief of GST are now being duty paid. 1st line "As Accounted For" portion – Show the total value of the goods for currency conversion in field 30 and the total value for duty of the goods in field 31. In field 32 (customs duties), show 00.00 as the goods were subject to full relief of duty. In field 35, show the value for tax applicable to the number of months the goods remained in Canada. In field 36, show the GST paid on the total value for tax (field 35). 1st line "As Claimed" portion – Show the total value of the goods for currency conversion in field 30 and the total value for duty of the goods in field 31. In field 32 (customs duties), show the duty payable on the total value for duty (field 31). In field 36, show the total GST payable on the total value for tax. Note: A sub-header number is shown in field 9 because the time limit (field 17) is being changed from 3 to 0. The original Form B3 had only one sub-header (1) as well as one classification line. a) A "Split Line" is defined as the correction of the accounting for multiple commodities on one classification line that are required to be accounted for on two or more separate accounting lines. b) Where the value on a given line decreases, established Form B2 processing methodology considers this a refund and applies interest according to refund provisions. If that same value is moved/incorporated into the value of another line, systems processing considers this a corrector, with an accounts receivable result due to the CBSA. Although the total value of the entire accounting document has not changed, the procedures do not consider the overall application, but instead look only at the individual lines. c) Where the entire value of an accounting line requires a change in tariff classification, only the affected line will be adjusted and will see the tariff classification on that one accounting line changed. The value of the line cannot be moved/incorporated into another existing line on the accounting document that contains the same tariff classification as the requested change. d) Where a portion of an accounting line requires a change (i.e. splitting of an accounting line), the portion that is not being changed is to remain on the original accounting line and the portion being removed must be shown as a split to a new line/lines from the original line. Further, this split will be shown either under an existing sub-heading or under a new sub-heading if the corresponding sub-heading information does not exist. The removed portion cannot be moved/incorporated into other existing line/lines on the accounting document with the same tariff classification as the requested change. e) Previous processing methods of moving the value between lines has had the effect that instead of only the one line being reviewed and having a decision rendered against it under Section 59 of the Customs Act, in fact a decision on two lines has been rendered: the original line from where the value came AND the second line where the value was moved. Further, this has closed one level of review against the second line, even though no review request was being made against it. Both lines would now require subsequent review levels of further re-determination even though no true re-determination request had been made against the second line initially. This has far-reaching effects should a subsequent review be required against this second line, including the application of the four-year time limit for the initial review and the 90-day time limit for subsequent reviews. This previous processing method also defeats expedient processing. Lastly, split lines provide a level of audit trail with respect to the reclassification or other adjustment of goods within a line. This is accomplished by keeping the "adjusted" portion of the line separate yet identifiable as having come from another originating line. f) All adjustment requests received by the CBSA that have moved values between lines, in lieu of the proper split line method, will be processed as presented. Future requests for correction due to incorrectly prepared submission will not be considered. Should such a submission result in a Detailed Adjustment Statement (DAS) being issued with interest amounts calculated, any amounts calculated will be payable and no consideration will be given to the refunding of this interest. Description: This image is of a sample B3. The Header is filled out including fields 1-4, 9-17, 20. Line 1 and Line 2 details are filled in. The declaration portion is completed. Description: This image is of a sample B3. The Header is filled out including fields 1-4, 9-17, 20. Line 3 details are filled in. The trailer has line 50 and the total field filled in. The declaration portion is completed. This example shows how to properly complete Form B2 when the entire line requires a tariff classification change, even though another accounting line of the same classification may exist. Description: This image is of a sample B2. The Header is filled in. Line 1 is described in the "As Accounted For" fields 18, 19, 21, 23,24,25,27,29, 30-32, 35, 36 and "As claimed" fields 18, 19, 21, 25, 27, 29-32, 35, 36 . A justification and explanation are provided and the declaration is filled in. This example shows how to properly complete Form B2 when a split to an existing line is required and the portion extracted falls under the same tariff classification number of an existing line. Description: This image is of a sample B2. The Header is filled in. Line 1 is described in the "As Accounted For" fields 18, 19, 21, 23, 24, 25, 27, 29-32, 35, 36 and "As claimed" fields 18, 21, 23-25, 27, 29-32, 35, 36. A split line is described in the "As Claimed" fields 18, 19, 21, 25, 27, 29-32, 35, 36. A justification and explanation are provided and the declaration is filled in. This example shows how to properly complete Form B2 when a split to an existing line is required and the portion being extracted falls under a different subheading that already exists on the original accounting document (i.e., Form B3). Description: This image is of a sample B2. The Header is filled in. Line 1 is described in the "As Accounted For" fields 18, 19, 21, 23-25, 29-32, 35, 36 and "As claimed" fields 18, 21, 23-25, 29-32, 35, 36. Description: This image is of a sample B2. The Header is filled in. Line 1 is describedas a split line in the "As claimed" fields 18, 19, 21, 25, 27, 29-31, 35, 36. A justification and explanation are provided and the declaration is filled in. This example shows how to properly complete Form B2 when a split to an existing line is required and the portion being extracted requires a new subheading that does not already exist on the original accounting document (i.e.Form B3). Description: This image is of a sample B2. The Header is filled in. Line 1 is described in the "As Accounted For" fields 18, 19, 21, 23-25, 27, 29-32, 35, 36 and "As claimed" fields 18, 21, 23-25, 27, 29-32, 35, 36. Description: This image is of a sample B2. The header is filled in. Line 1 is described as a split line in the "As claimed" fields 18, 19, 21, 25, 29-32, 35, 36. A justification and explanation are provided and the declaration is filled in. A Detailed Adjustment Statement (DAS) is generated for each adjustment resulting from either an importer/agent request (i.e. Form B2) or a CBSA initiated adjustment. (An adjustment may pertain to a single Form B3 transaction or may be a blanket adjustment covering several transactions.) A copy of the DAS is sent to the importer upon completion of the adjustment and, if applicable, to the agent indicated on the Form B2 or on the CBSA record in the case of a CBSA initiated adjustment. The DAS Header consists of fields 1, 2, 3, 5, 6, 7, 10, and 11, importer number and page number and contains the information from the original Form B3 transaction including any changes made through the adjustment. Header information is printed on all DAS pages except fields 5, 6, and 7 which are printed only on those pages containing sub-header or classification line information. The DAS Sub-header consists of fields 9, 12, 13, 14, 15, 16 and 17. Sub-header information is printed where a classification line is connected to a different sub-header, a new sub-header record has been created or where information on a sub-header has changed. Sub-header information is not printed if the adjustment request has been cancelled. b) where a classification line or portion of a line is moved from one sub-header to another (i.e., 02 would be shown where classification line 1 is being moved from sub-header 1 to 2). "NS" + the CBSA assigned sub-header number will be shown where a new sub-header record has been created (i.e., a new sub-header (NS + 03) is required to change the tariff treatment from MFN to UST). A new DAS page is created each time the contents of field 9 changes or when the information in any of the fields 12 to 17 of an existing sub-header changes. The pages are created in numerical sequence according to sub-header number. The DAS Classification line consists of fields 18 to 36. Classification line information is printed where the sub-header number associated with the classification line has changed, a new classification line record has been created, or where classification line information has changed. No classification line information is printed if the adjustment request has been cancelled. Classification lines are printed in numerical sequence according to classification line and sub-header numbers. Field 18 contains either an existing line number or a CBSA assigned line number if a classification line record has been created. If a classification line has been deleted from the accounting record, only the classification line number is printed together with the statement, "Classification Line Has Been Deleted". 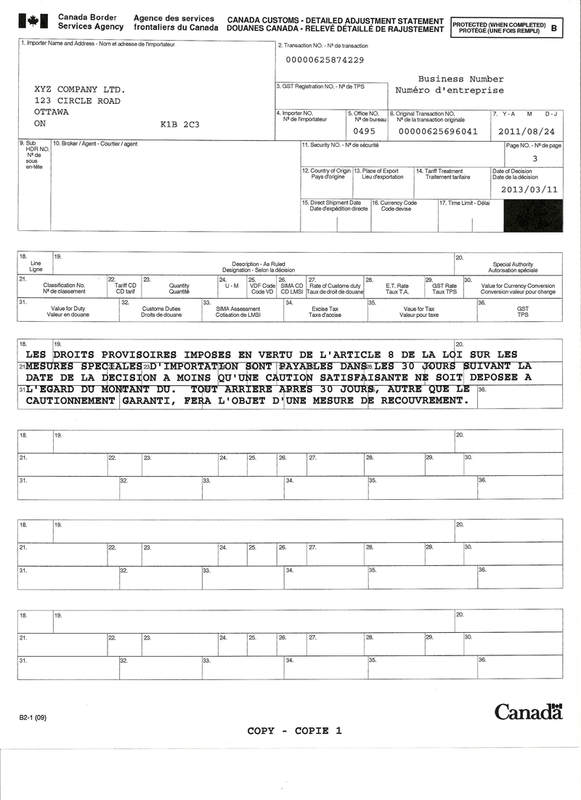 If an adjustment request to change classification line information has not been cancelled but the CBSA officer believes that the original Form B3 information or previous DAS information is correct, the classification line number is printed together with the statement: "Classification Line Remains as Entered". The B3 Trailer Update is printed at the end of each Form B3 record associated with the adjustment and contains the adjusted totals of the B3 trailer. The remarks are printed after the last B3 trailer update and include the CBSA officer's comments, and if applicable, legislative statements, adjustment procedures, the date interest begins, the principal for interest and payment information. The DAS Accounting Summary is printed on a separate page at the end of the adjustment and consists of the duty amounts resulting from the adjustment, the adjustment total and whether the adjustment total is due to the Receiver General or to the claimant. When the adjustment total involves monies due to the Receiver General, an additional set (four copies) of the DAS Accounting Summary is printed for each instance where payment time limits differ, e.g., if SIMA duties and customs duties are assessed, two sets (eight pages) are printed – one set for the SIMA duties (payable within 30 days) and one set for the customs duties (payable within 90 days). If the adjustment is initiated by the CBSA, the additional set is sent to the importer or, if applicable, the agent indicated on the agency record. If the adjustment results from an adjustment request, the additional set of copies is sent to the party indicated in Field 1 (Importer Name and Address) unless Field 10 (Mail To) is completed. When the "Mail To" Field is completed, the additional copies of the DAS will be sent to the party named in the field. These additional copies are notated "Remittance Copy" and should be presented when payment is being made or when security is being given. The examples included in this section are designed to provide importers/agents with information regarding the different types of DAS being issued by the CBSA. Description: This image displays the first page of a DAS for an adjustment request for a refund that has been granted under section 74 of the Customs Act. 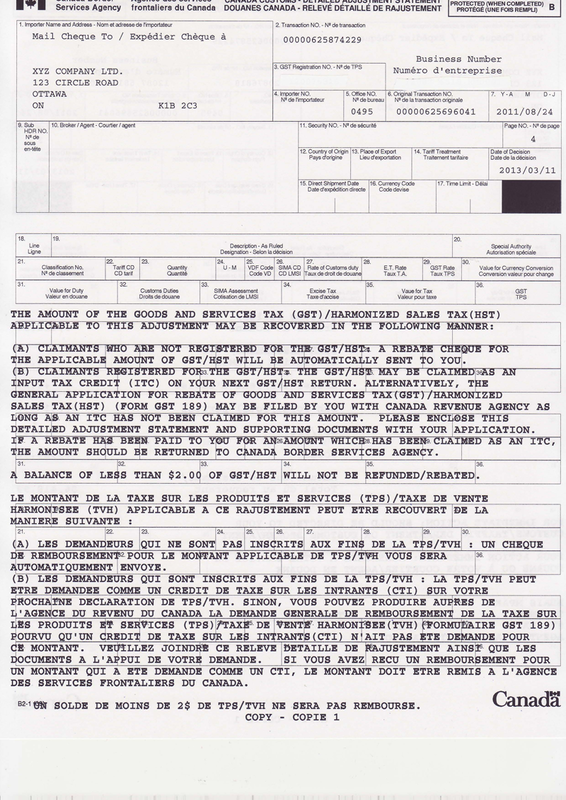 It includes written comments informing the importer of the CBSA's contact information, that the importer's refund has been granted, that the decision constitutes a re-determination under section 59 (1)(a) of the Customs Act and that the CBSA has the right to make a further re-determiantion under section 59(1)(b) of the Customs Act at a later date. 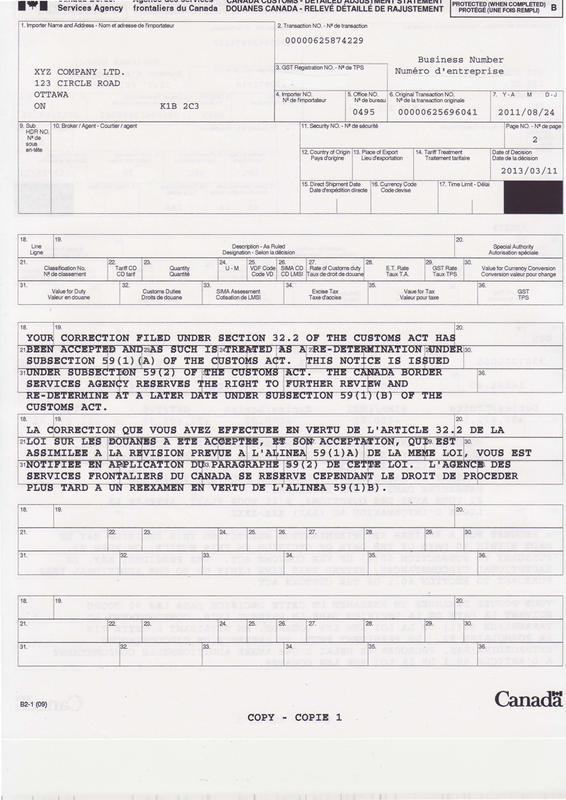 Description: This image displays the second page of the same DAS, which shows written comments informing the importer of their right to appeal the CBSA's decision under section 60 of the Customs Act. Description: This image displays the third page of the DAS, where there is a breakdown of the amounts due to the claimant: Customs Duties, SIMA Assessment, Excise Tax, Subtotal, GST, Total, Amount due to claimant. Description: This image displays the final page of the DAS, where it provides information to the importer on how to recover their amounts of GST though the Canada Revenue Agency. Description: This image displays the first page of a DAS resulting from a non-revenue adjustment request submitted under section 32.2 of the Customs Act. It includes written comments informing the importer of the CBSA's contact information, and informing the importer of their right to appeal under section 60 of the Customs Act. Description: This image displays the second page of a DAS. It includes written comments that the decision is treated as a re-determination under section 59 (1)(a) of the Customs Act and that the CBSA has the right to make a further re-determiantion under section 59(1)(b) of the Customs Act at a later date. Description: This image displays the third page of a DAS with a breakdown of the amounts due to the claimant: Customs Duties, SIMA Assessment, Excise Tax, Subtotal, GST, Total, Amount due to claimant. In this case, since the change was non-revenue all of the amounts are 0. 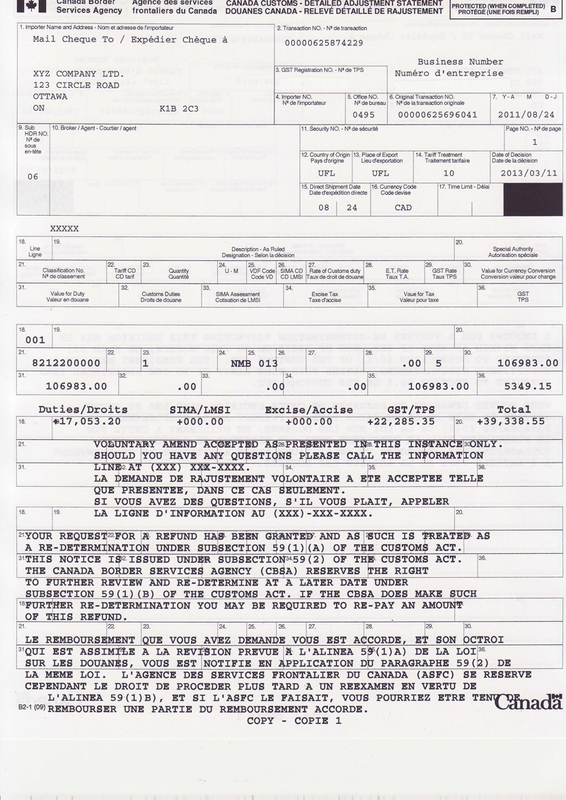 Description: This image displays the first page of a DAS resulting from an accounts receivable adjustment request submitted under section 32.2 of the Customs Act. It includes written comments informing the importer of the CBSA's contact information, and informing the importer of their right to appeal under section 60 of the Customs Act. 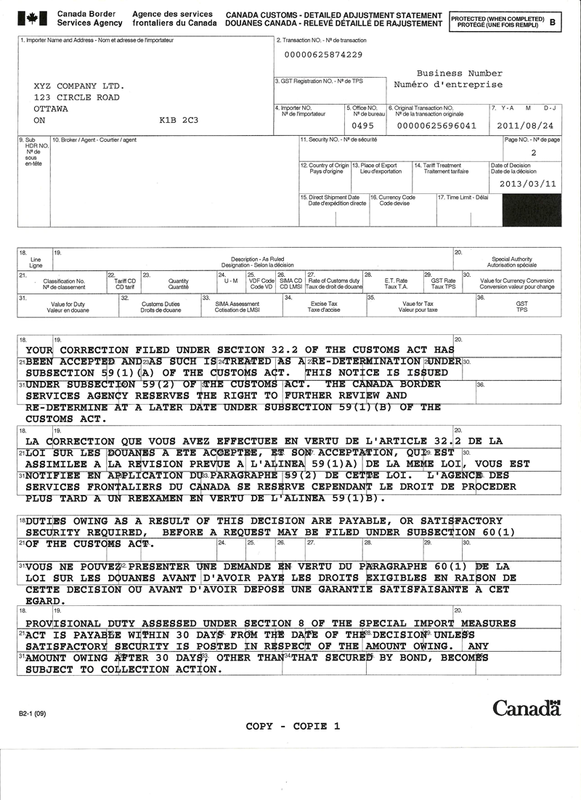 Description: This image displays the second page of a DAS, informing the importer that the decision is treated as a re-determination under section 59 (1)(a) of the Customs Act and that the CBSA has the right to make a further re-determiantion under section 59(1)(b) of the Customs Act at a later date. It also informs the importer that duties are owing as a result of this DAS and that payment must be received or security posted before a request can be filed under section 60 of the Customs Act and that amounts of provisional duty owing under the Special Import Measures Act are due within 30 days of the decision date, or else it will be subject to collection action. Description: This image displays a continuation of the comments on the previous image, in French. Description: This image displays the fourth page of a DAS with a breakdown of the amounts owing to the CBSA: Customs Duties, SIMA Assessment, Excise Tax, Subtotal, GST and Total. It states that payment is due immediately and if it is not paid within 30 days it will be subject to additional interest at the specified rate. 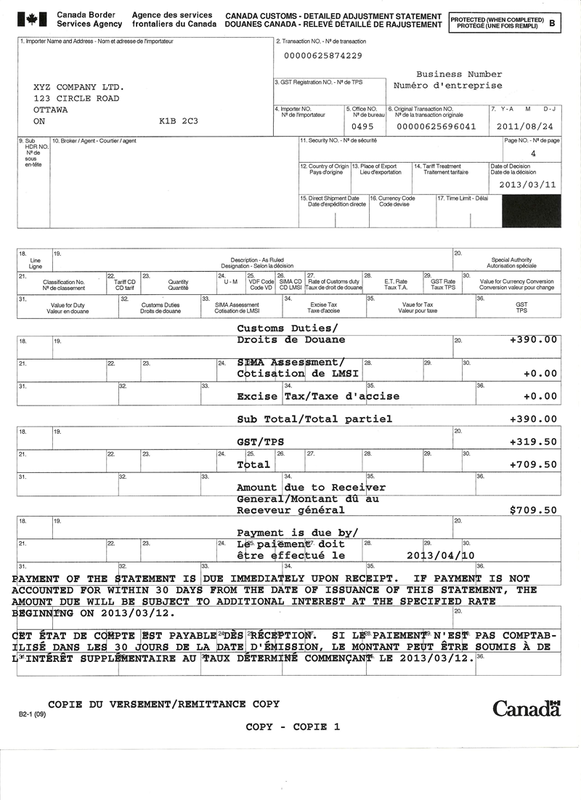 Description: This image displays the final page of a DAS, which has comments informing the importer where they can make their payment and which methods of payment are acceptable.